OUR ADDRESS IS 2659 PROFESSIONAL CIRCLE, SUITE 1114, NAPLES FL 34119. WE ARE LOCATED EAST OF I-75, (EXIT 111) ON THE NORTH SIDE OF IMMOKALEE ROAD, NEAR HODGES UNIVERSITY. The Naples Social Security office is located in Naples 34119. The following page includes information for this location like the office phone number, hours of operation and driving directions. If you have any interests or comments about your retirement benefits or are interested in making an appointment, call the following Naples Social Security office. The Naples Social Security office is located at Naples 34119. The Florida SSA provides different federally run plans like retirement, SSI, Medicare and disability benefits. The following page contains relevant contact information for this location such as the Social Security office phone number, hours of operation, and driving directions. 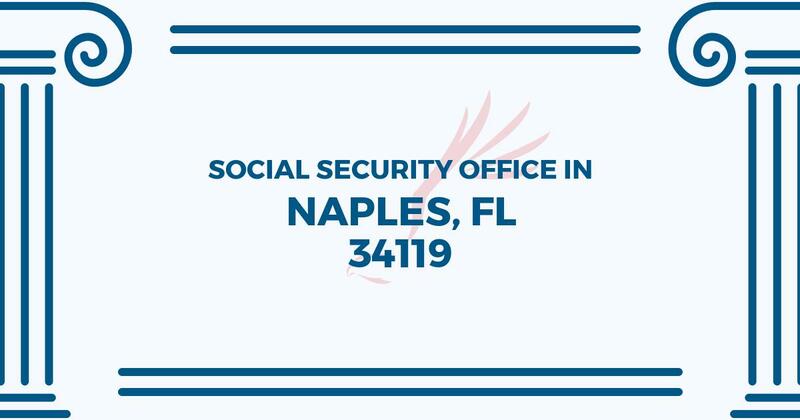 If you have any comments or inquiries related to your retirement Social Security benefits or interested in making an appointment, call the following Naples Social Security office. If you show up with out an appointment you take a number and wait maybe more than 1 hour but not more than 2. It’s a busy place but there seems to be enough agents to help in a timely period. Make sure you take ALL you documents there. There’s restrooms and water fountains. Parking is sufficient…..follow the signs to get there. Was in and out in less than an hour! I was there first thing in the morning and waited just a few minutes before they opened the doors. Bring something to read just in case because by the time the windows opened, the place was packed and names/numbers are called at random.